Highlights of Portugal's capital, the sherry wine region in Andalusia, five nights in Morocco, cross the Straits of Gibraltar and visit the Rock, relax at the Costa del Sol, and visit Madrid's Prado amongst other adventures. This tour will take you through three of the most unique cultures in a short period of time. 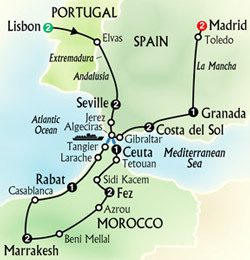 Tour Portugal, Spain and Morocco. For those who wish to see it all, this 17-day vacation is unforgettable. You start in Lisbon, and visit Jeronimos Monastery, then travel south to Seville, Spain, where sightseeing includes a visit to Columbus' tomb. Overnight in Rabat in Morocco allows time to admire the Royal Palace and to visit the Mohammed V Mausoleum and Chellah's Roman Relics. Next are exotic Casablanca and Marrakesh, with sightseeing including Menara Park, Bahia Palace and the Saadian Tombs. In Fez you will be guided through the labyrinthine Fes-el-Bali to the exquisite Medersa Attarine. Overnight in Tangier with sightseeing at the Grand Socco Market and the Forbes Museum, before sailing across the Straits to the Bay of Algeciras with time to visit St. Michael's Caves at the strategic rock fortress of Gibraltar. A whole day at leisure on the Costa del Sol before you continue via Granada and Toledo to Madrid for two nights, with an included visit to the Prado Museum. Day 2, ARRIVAL IN LISBON, PORTUGAL. Free time to rest or explore the Portuguese capital. At 6 p.m. meet for a welcome drink hosted by your tour director. Now the capital of a small country on the western fringe of the Iberian Peninsula, Lisbon was the center of Europe’s longest-lived overseas empire. Portugal’s imperial ambitions date back to Prince Henry the Navigator’s 15th-century discoveries in West Africa and did not subside until the 1970s. History has left its marks on the city, in striking contrast with modern features. Morning sightseeing on the banks of the Tagus River includes two Manueline jewels: Belem Tower guarding the mouth of the Tagus and Jeronimos Monastery with the tomb of Vasco da Gama. Drive past the Bull Ring to Pombal Statue and on along the grand Avenida da Liberdade. Then enjoy a walk through the cobbled alleys of quaint Alfama, the quarter of the seamen. Afternoon and evening free; your tour director will propose an optional excursion to the royal palace of Queluz or Sintra, and an optional dinner at a typical taverna with Fado-style entertainment. Day 4, LISBON / SEVILLE, SPAIN. On the way to Spain stop at Elvas, noted for a 16th-century aqueduct which still supplies this market town with water. Cross the border near the historic citadel of Badajoz and drive through Extremadura, the arid homeland of the conquistadors Cortés and Pizarro. Late afternoon arrival in the vibrant capital of Andalusia. Listen to your local expert’s account of the city’s role in Roman times, its conquest by the Moors in 712, its contribution to the discovery of the New World. Admire Maria Luisa Park. Drive to the Plaza de España, the Gold Tower on the Guadalquivir River, and the fine Baroque building which is now the university but used to be the tobacco factory of Carmen fame. Visit the cathedral with Columbus’ tomb. Finally stroll through the narrow lanes of the charming Santa Cruz quarter. For a truly Andalusian night out, reserve a seat at our optional flamenco show. Day 6, SEVILLE / RABAT, MOROCCO. By coach through the sunny sherry wine region of Jerez to Algeciras, and on by ferry across the Straits of Gibraltar to Africa. Along North Africa’s infamous Barbary Coast to Rabat, once a lair of the corsairs and now the country’s capital. Day 7, RABAT / CASABLANCA / MARRAKESH. Sightseeing focuses on the massive medieval battlements, the Royal Palace, Mohammed V Mausoleum, Hassan Tower, and the Casbah of Ouidaias. Visit the fine Roman relics of Chellah. Then leave Rabat and follow the shoreline of the Atlantic Ocean for a visit to Casablanca, Morocco’s modern seaport with a strong French accent. See the Hassan II Mosque, a splendid monument designed to mark the end of the century. Evening arrival in Marrakesh. Day 9, MARRAKESH / FEZ. Glimpse North African village life while motoring through Beni Mellal and Azrou towards Fez. Strategically situated, Fez became the capital of Morocco when the country shook off foreign rule in the 8th century. To this day, Fez has remained Morocco’s spiritual and artistic center. See the magnificent entrance to the Royal Palace, drive through the Mellah, the old Jewish quarter, and travel on to beautifully ornate Bab Bou Jeloud, the traditional entrance to old Fez. Your local guide also leads you through the labyrinthine Fes-El-Bali, Morocco’s largest medina, to the exquisite Medersa Attarine. Enjoy a ten-mile drive along the panoramic Route de Fez. Back to your hotel with plenty of time to relax by the pool. Tonight your tour director may suggest an optional folklore dinner. Day 11, FEZ / CEUTA, SPAIN. Leave Fez, head north through the Gharb. Take the scenic route through the northern foothills of the Rif Mountains to Chechaouen. Overnight in the Spanish enclave of Ceuta, located on the North African side of the Straits of Gibraltar. Day 12, CEUTA / COSTA DEL SOL. Board your ferry for the trip back across the Straits to Europe. Cameras ready as you approach the Bay of Algeciras; the vistas of the Rock of Gibraltar are spectacular. Time for a visit to the strategic rock fortress of Gibraltar, in British hands since 1704. Hear about its turbulent history, see the Moorish Castle, and St. Michael’s Caves. Also on the agenda, of course, the colony of Barbary apes. Then a pleasant drive along the elegant Costa del Sol. Day 13, COSTA DEL SOL. A day at leisure to catch up on your postcards, enjoy the sandy beaches, browse through trendy boutiques, sample the many fancy restaurants... or simply relax. Day 14, COSTA DEL SOL / GRANADA. Away from the sea and into the mountains to Granada. This afternoon, view its main attraction, the Alhambra. The mighty yet graceful citadel was planned by the 13th-century Moorish ruler Al Ahamar. A fantasy of “lace in stone,” it affords superb views of the Old Quarter and Sacromonte, a mountain occupied by gypsy cave dwellers. Also amble through the Water Gardens of the Generalife, the royal summer residence. Day 15, GRANADA / TOLEDO / MADRID. El Greco’s most famous paintings. The capital of Spain since 1561, Madrid today is a strikingly modern city. Sightseeing includes the Puerta del Sol, Plaza España with its monument to Cervantes, Parliament, Cibeles Fountain, Calle Alcala and Paseo de Castellana. Then the highlight: the Prado Museum with its priceless art treasures. Afternoon free. Day 17, Your homebound flight from Madrid arrives the same day.